Subarachnoid hemorrhage (SAH) is a condition in which there is bleeding into the subarachnoid space around the brain and spinal cord, as shown in the images below. This space is normally filled with clear, colorless cerebrospinal fluid (CSF). The most common causes of subarachnoid hemorrhage are head trauma and rupture of an intracranial aneurysm. Atraumatic subarachnoid hemorrhage accompanied by the sudden onset of neurologic symptoms has been termed hemorrhagic stroke. Radiologic evaluation is essential for determining the prognosis and treatment of subarachnoid hemorrhage. Radiologic interventional procedures have become increasingly important for the management of this condition. Subarachnoid hemorrhage (SAH). A nonenhanced computed tomography scan of the brain that demonstrates an extensive SAH filling the basilar cisterns in a patient with a ruptured intracranial aneurysm. 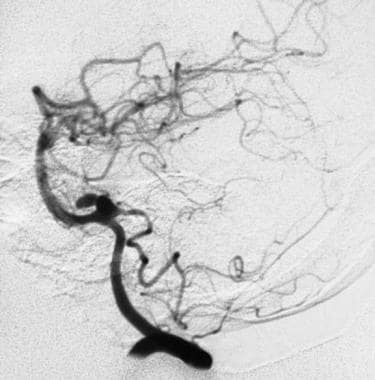 An angiogram showing the onset of an aneurysmal rupture, with extravasation of contrast material into the subarachnoid space from the anterosuperior aspect of a bilobed aneurysm in a posteroinferior cerebellar artery. A late angiogram demonstrating contrast medium filling the posterior fossa subarachnoid spaces, including the ambient, prepontine, and perimedullary cisterns. Rupture of a saccular intracranial aneurysm causes approximately 80% of nontraumatic subarachnoid hemorrhage. Intracranial aneurysms develop predominantly at vessel bifurcation or branching points. Saccular aneurysms are acquired lesions that rarely present before the third decade of life. Most intracranial aneurysms occur at typical locations within or near the circle of Willis. The most common specific locations of intracranial aneurysms are at the middle cerebral artery bifurcation and along the anterior communicating artery. These 2 locations account for approximately 60% of all intracranial aneurysms. Other common sites of aneurysm formation in the anterior circulation are at the origins of the posterior communicating and ophthalmic arteries. Approximately 10-20% of aneurysms arise from the vertebral and basilar arteries. The tip of the basilar artery is the most common location of aneurysm formation in the posterior circulation. The origins of the posterior inferior cerebellar arteries also are common sites of aneurysm formation. Arteriovenous malformations (AVMs) occur throughout the brain without predisposition for a particular anatomic area. Although the primary indication for GDC embolization of an intracranial aneurysm is for patients with surgically high-risk aneurysms, a growing body of evidence indicates that endovascular treatment should be considered as a primary option for aneurysm in certain anatomic locations. Specifically, patients with basilar tip aneurysms appear to have better outcomes with endovascular therapy than with open craniotomy and surgical aneurysm clipping. The technical expertise and experience of the local treating physicians may determine the optimal treatment for aneurysms at other locations. 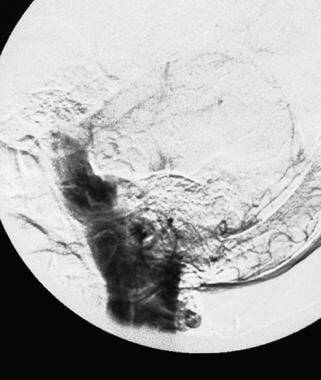 At most institutions in the United States, conventional angiography remains the standard for evaluating patients with subarachnoid hemorrhage. 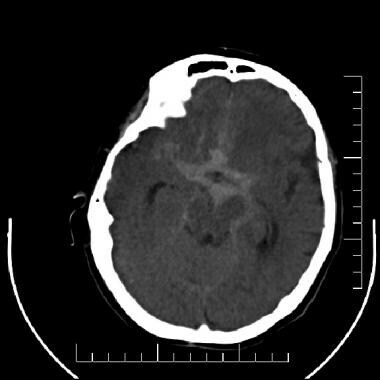 If a CT scan of the brain is negative and a strong clinical suggestion of subarachnoid hemorrhage exists, a CSF tap may be of value for confirming this diagnosis. If the CSF reveals no evidence of subarachnoid hemorrhage (ie, either overt hemorrhage or xanthochromia), cerebral angiography may not be indicated. Nonenhanced CT scanning may fail to depict small subarachnoid hemorrhages, particularly if imaging is performed several days after the onset of bleeding. Furthermore, CT scans are degraded by patient motion. If a patient cannot cooperate because of an alteration in mental status, sedation may be necessary to obtain satisfactory diagnostic images. Cerebral angiography is an invasive procedure with a small but significant risk of complication. Without the use of a special hemostasis device, at least 6 hours of bed rest is required after the procedure to prevent bleeding at the puncture site. Additionally, because of its small false-negative rate for aneurysm, cerebral angiography must be repeated after 1-2 weeks to further improve its diagnostic sensitivity. The differential diagnosis includes cerebral aneurysm, cerebral arteriovenous malformation, and stroke. Traumatic subarachnoid hemorrhage must be distinguished from spontaneous subarachnoid hemorrhage. Cerebral angiography may sometimes be avoided if it can be confidently established that the hemorrhage is caused by trauma. This distinction can be difficult to make, because the traumatic event may not have been witnessed and the patient may be unable to provide a reliable history. There is often a question as to whether a spontaneous subarachnoid hemorrhage has caused a traumatic event or the trauma caused the hemorrhage. When in doubt, it is usually best to obtain a cerebral angiogram to exclude an underlying aneurysm or vascular malformation; such angiograms can sometimes be limited to the location of the hemorrhage, if no pathology is detected. In unresponsive or unreliable patients requiring magnetic resonance imaging (MRI), plain radiographs of the skull and orbits may be used to exclude the presence of aneurysm clips or intraorbital foreign bodies. Plain radiographs may also be useful for evaluating facial or cervical spinal fractures to assess the probability of traumatic subarachnoid hemorrhage (SAH) versus spontaneous SAH. Some neuroradiologists use skull radiographs in their routine follow-up care of patients with aneurysm treated with coil embolization. Interval follow-up skull radiographs can be compared with baseline studies to check for coil compaction. The degree of confidence is high for the purposes stated above; however, plain radiography offers no reliable findings for detecting SAH. Guglielmi detachable coils (GDC) have been observed to shift in position during the subsequent thrombosis of large and medium-sized aneurysms. This finding does not necessarily indicate that the aneurysm is patent. Cerebral angiography should be performed when any change in coil position is observed on postembolization follow-up studies. On CT scans, subarachnoid hemorrhage (SAH) appears as a high-attenuating, amorphous substance that fills the normally dark, CSF-filled subarachnoid spaces around the brain, as shown in the images below. 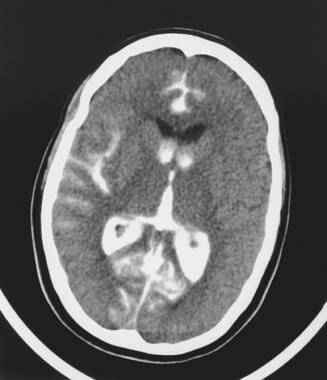 The normally black subarachnoid cisterns and sulci may appear white in acute hemorrhage. These findings are most evident in the largest subarachnoid spaces, such as the suprasellar cistern and Sylvian fissures. A computed tomography scan obtained after angiography of a rupturing bilobed aneurysm of the posteroanterior cerebellar artery. This image shows a subarachnoid hemorrhage and contrast medium filling the right sylvian fissure, the interhemispheric fissure, and the lateral and third ventricles. Over the cerebral hemispheres, SAH is exhibited by the filling in of normally low-attenuating (black) sulci with high-attenuating (white) subarachnoid blood. SAH is most conspicuous within 2-3 days of the onset of acute bleeding. Acute SAH is typically 50-60 Hounsfield units (HU). The protein content of the hemoglobin molecule is predominantly responsible for the attenuating effect of blood; therefore, the absolute measurement in HU varies somewhat with the hematocrit value. When CT scanning is performed several days or weeks after the initial bleed, the findings are more subtle. The initial high-attenuation of blood and clot tend to decrease, and these appear as intermediate gray. These findings can be isointense relative to normal brain parenchyma. If the patient presents during this subacute period, evidence of SAH includes decreased visualization of the normally hypoattenuating fluid within the sulci and basal cisterns and enlargement of the ventricles caused by communicating hydrocephalus. In addition to detecting SAH, CT scanning is useful for localizing the source of bleeding. This is particularly important in cases of multiple intracranial aneurysms, which occur in 20% of patients. Localization of SAH on CT scans correlates with the location of the ruptured aneurysm. The presence of blood in the anterior interhemispheric fissure or the adjacent frontal lobe suggests rupture of an anterior communicating artery aneurysm. Sylvian fissure clot correlates with an ipsilateral middle cerebral artery aneurysm. Blood predominantly localized in the posterior fossa suggests bleeding from a posterior circulation aneurysm. The ability to discern the location of an aneurysm rupture is limited by the fact that many patients with SAH have a diffuse distribution of blood in the subarachnoid spaces and basal cisterns on CT scans. The effect of gravity has been suggested as a possible cause for misleading patterns of blood distribution. Published studies report a wide variation in the accuracy of CT scanning in localizing the bleeding source. Nonenhanced CT scanning of the brain is the study of choice for the initial evaluation of patients with potential SAH. The sensitivity is 93-100% in patients presenting with SAH within 24 hours of symptom onset. Conversely, the detection of SAH on CT scanning has a 0-7% false-negative rate during this period. As the time from the onset of the bleeding episode increases, the sensitivity of CT scanning decreases. At 5 days, the sensitivity is approximately 85%; at 1 week, it is approximately 50%. An interval of days to weeks between the bleeding episode and the CT scan allows for the breakdown and resorption of some or all of the hemoglobin from the subarachnoid space, decreasing the contrast between the SAH and CSF. Similarly, small amounts of SAH may be masked by dilution by the CSF and/or CT volume averaging with CSF. Motion artifacts occurring in the scans of agitated or confused patients can lead to either false-positive or false-negative SAH diagnoses. In vivo and in vitro studies suggest that FLAIR MRI is as sensitive as or more sensitive than CT scanning in the evaluation of acute SAH; however, compared with lumbar puncture, FLAIR MRI cannot exclude SAH. Relative to CT scanning, MRI is often more valuable in the subacute phase of SAH, in which the density of hemorrhage on CT scans decreases. In patients with equivocal findings on CT scanning or angiography or in those patients who cannot undergo CT scanning or conventional angiography, MRI and/or MRA may provide clinically useful information. Magnetic field inhomogeneity can lead to artifactual increase in signal intensity in sulci over the cerebral convexities on FLAIR images, which can mimic SAH. CSF flow artifacts can mimic the appearance of SAH on either T1- or T2-weighted images. Intracranial thrombus can appear similar in signal to flowing blood on time-of-flight (TOF) gradient-echo (GRE) MRA. In uncooperative patients, motion artifacts may produce images that can lead to either false-positive or false-negative interpretations. Echoencephalography is useful for diagnosing germinal matrix and intraventricular hemorrhage in the newborn; however, ultrasonography has no direct role in the diagnosis of subarachnoid hemorrhage (SAH) in the adult patient. Conversely, transcranial Doppler ultrasonography has become increasingly used in the diagnosis and management of vasospasm in patients with SAH. Serial transcranial Doppler ultrasonographic examinations accurately detect the presence of vasospasm and allow for the maximization of medical therapy for vasospasm before the patient becomes symptomatic. Increases in flow velocity correspond to cross-sectional diameter decreases in vessel lumen resulting from vasospasm. The more severe the vasospasm, the higher the flow velocity. Flow is most easily measured in the middle cerebral arteries, which have been found to have flow velocities normally in the 30-80 cm/s range. Elevation to 120 cm/s indicates moderate vasospasm, and elevation to 200 cm/s indicates severe vasospasm. Single abnormal measurements are much less reliable then serial examinations that performed to establish patient baseline velocities before the development of vasospasm. The sensitivity of transcranial Doppler ultrasonographic imaging for the detection of vasospasm has been reported to be 85-90%. Because not all vasospasm is necessarily symptomatic, the finding must be correlated with a clinical neurologic examination to determine the appropriate therapy. Elevated intracranial vascular flow from an arteriovenous malformation or fistula may cause high flow velocities in the absence of vasospasm. Similarly, elevation of cardiac output from any cause generally leads to a systemic increase in flow velocities. Doppler ultrasonographic measurements are highly dependent on technical factors. Inaccuracy in the angle of insonation may result in artifactual elevation or reduction in the reported velocity measurements. Like ultrasonography, nuclear medicine studies are not useful in the initial diagnosis of subarachnoid hemorrhage (SAH), but they can play a role in the diagnosis of related vasospasm. The nuclear medicine study technique that is most used for this purpose is single-photon emission computed tomography (SPECT) scanning with the radiopharmaceutical technetium-99m (99m Tc) hexamethylpropyleneamine oxime (HMPAO). SPECT scanning allows for the evaluation of qualitative or semiquantitative regional blood flow. The information provided is complementary to the transcranial Doppler ultrasonographic findings. SPECT scanning demonstrates perfusion of the brain tissue, whereas transcranial Doppler ultrasonography provides information about the flow in medium and large intracranial arteries. These 2 data sets are independent variables. The results of 99mTc HMPAO SPECT scanning are semiquantitative and qualitative in that the cerebellum is generally considered as a control value for normal perfusion. Generalized cerebral hypoperfusion may go unrecognized, but this pattern is not typical of vasospasm. Because early vasospasm is frequently asymptomatic, correlation with serial clinical examination is crucial to establish the appropriate therapy. Clinical use of this study is hampered by the qualitative nature of the results. Absolute negative results are uncommon, and positive results may not be clinically relevant. Space-occupying lesions such as cerebral hematoma can cause perfusion defects on SPECT perfusion imaging. These should be obvious when correlated with conventional CT scan images. Hydrocephalus can lead to a global decrease in cerebral perfusion which, because of the lack of absolute quantification of the cerebral blood flow, could go unrecognized. Cerebral angiography is considered the standard imaging technique for the detection of intracranial aneurysms, arteriovenous malformations (AVMs), and fistulae, as shown in the images below. Aneurysms are detected as focal areas of outpouching or dilatation of the arterial wall. These frequently occur at arterial branching points in characteristic locations within or near the circle of Willis. Cerebral angiography should include anteroposterior (AP), lateral, and one or more oblique views of both carotid and vertebral artery contrast injection studies. A submentovertical view is sometimes useful in demonstrating the neck of a middle cerebral artery bifurcation aneurysm or anterior communicating artery aneurysm. 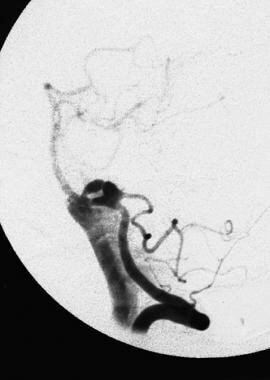 An angiogram showing a bilobed aneurysm of a posteroinferior cerebellar artery immediately before rupturing. 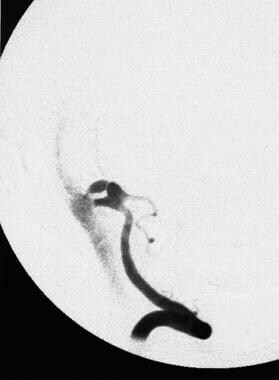 A later-phase angiogram of a rupturing bilobed aneurysm of a posteroinferior cerebellar artery shows progressive opacification of the subarachnoid space in the posterior fossa. Compression of the contralateral carotid artery should be performed during carotid cerebral angiography to demonstrate the anterior communicating artery if it does not fill spontaneously during one of the internal carotid artery injections. Carotid artery compression should be done on a segment of the common carotid artery without atherosclerotic plaque, if possible. One vertebral arteriogram is occasionally omitted by some angiographers if there is abundant reflux proximal to the origin of the posterior inferior cerebellar artery of that vertebral artery when the contralateral vertebral artery is injected with contrast medium. This technique does not, however, depict all aneurysms. The most reliable method of aneurysm detection is the invariable selective injection of contrast medium into both common or internal carotid arteries and both vertebral arteries. Cerebral angiography provides a high degree of accuracy. A small false-negative rate does occur, probably in the range of 1-2%. A repeat cerebral arteriogram at 10-14 days is indicated if the initial angiogram does not demonstrate the cause of a subarachnoid hemorrhage (SAH). In a small number of patients, a follow-up angiogram will detect an aneurysm that was not demonstrated on the initial study. Bilateral selective external and internal carotid artery angiograms can be performed to exclude a dural arteriovenous fistula, which is a rare cause of SAH. Bilateral vertebral arteriograms of the neck (and, if necessary, selective thyrocervical trunk and/or careful injections of the right superior intercostal artery) demonstrate the arterial and venous circulation of the cervical spinal cord. In rare cases, they show a spinal vascular malformation or neoplasm, such as hemangioblastoma, as the cause of SAH. The reason that some aneurysms are not initially diagnosed by angiography and are only detected on subsequent follow-up angiograms is not always evident. Vasospasm is believed to be the most common cause. Arteriographic double densities simulating aneurysm or apparent areas of vessel wall bulge or outpouching may be caused by arterial tortuosity and atherosclerosis or overlap of adjacent arteries on standard angiogram views. This can usually be determined by comparing all angiographic views and, if necessary, obtaining additional oblique arteriographic views. Ingall T, Asplund K, Mahonen M. A multinational comparison of subarachnoid hemorrhage epidemiology in the WHO MONICA stroke study. Stroke. 2000 May. 31(5):1054-61. [Medline]. Johnston SC. Effect of endovascular services and hospital volume on cerebral aneurysm treatment outcomes. Stroke. 2000 Jan. 31(1):111-7. [Medline]. Macdonald RL, Kassell NF, Mayer S, Ruefenacht D, Schmiedek P, Weidauer S, et al. Clazosentan to overcome neurological ischemia and infarction occurring after subarachnoid hemorrhage (CONSCIOUS-1): randomized, double-blind, placebo-controlled phase 2 dose-finding trial. Stroke. 2008 Nov. 39(11):3015-21. [Medline]. Kronvall E, Undrén P, Romner B, Säveland H, Cronqvist M, Nilsson OG. Nimodipine in aneurysmal subarachnoid hemorrhage: a randomized study of intravenous or peroral administration. J Neurosurg. 2009 Jan. 110(1):58-63. [Medline]. Bederson JB, Connolly ES Jr, Batjer HH, Dacey RG, Dion JE, Diringer MN, et al. Guidelines for the Management of Aneurysmal Subarachnoid Hemorrhage. A Statement for Healthcare Professionals From a Special Writing Group of the Stroke Council, American Heart Association. Stroke. 2009 Jan 22. [Medline]. Stewart H, Reuben A, McDonald J. LP or not LP, that is the question: gold standard or unnecessary procedure in subarachnoid haemorrhage?. Emerg Med J. 2013 Jun 11. [Medline]. Castelnovo G, Renard D. Unmasking a subarachnoid hemorrhage. Neurology. 2013 Jun 11. 80(24):2274. [Medline]. Meurer WJ, Walsh B, Vilke GM, Coyne CJ. Clinical Guidelines for the Emergency Department Evaluation of Subarachnoid Hemorrhage. J Emerg Med. 2016 Jan 25. [Medline]. Edlow JA, Caplan LR. Avoiding pitfalls in the diagnosis of subarachnoid hemorrhage. N Engl J Med. 2000 Jan 6. 342(1):29-36. [Medline]. Ro A, Kageyama N, Abe N, Takatsu A, Fukunaga T. Intracranial vertebral artery dissection resulting in fatal subarachnoid hemorrhage: clinical and histopathological investigations from a medicolegal perspective. J Neurosurg. 2009 Feb 6. [Medline]. Latchaw RE, Silva P, Falcone SF. The role of CT following aneurysmal rupture. Neuroimaging Clin N Am. 1997 Nov. 7(4):693-708. [Medline]. Marder CP, Narla V, Fink JR, Tozer Fink KR. Subarachnoid hemorrhage: beyond aneurysms. AJR Am J Roentgenol. 2014 Jan. 202(1):25-37. [Medline]. Balinger KJ, Elmously A, Hoey BA, Stehly CD, Stawicki SP, Portner ME. Selective computed tomographic angiography in traumatic subarachnoid hemorrhage: a pilot study. J Surg Res. 2015 Nov. 199 (1):183-9. [Medline]. Yuzawa H, Higano S, Mugikura S, Umetsu A, Murata T, Nakagawa A. Pseudo-subarachnoid hemorrhage found in patients with postresuscitation encephalopathy: characteristics of CT findings and clinical importance. AJNR Am J Neuroradiol. 2008 Sep. 29(8):1544-9. [Medline]. Mark DG, Sonne DC, Jun P, Schwartz DT, Kene MV, Vinson DR, et al. False negative interpretations of cranial computed tomography in aneurysmal subarachnoid hemorrhage. Acad Emerg Med. 2016 Feb 26. [Medline]. Stuckey SL, Goh TD, Heffernan T, Rowan D. Hyperintensity in the subarachnoid space on FLAIR MRI. AJR Am J Roentgenol. 2007 Oct. 189(4):913-21. [Medline]. Mulé S, Soize S, Benaissa A, Portefaix C, Pierot L. Detection of aneurysmal subarachnoid hemorrhage 3 months after initial bleeding: evaluation of T2* and FLAIR MR sequences at 3 T in comparison with initial non-enhanced CT as a gold standard. J Neurointerv Surg. 2015 Jul 24. [Medline]. Morris JM, Miller GM. Increased signal in the subarachnoid space on fluid-attenuated inversion recovery imaging associated with the clearance dynamics of gadolinium chelate: a potential diagnostic pitfall. AJNR Am J Neuroradiol. 2007 Nov-Dec. 28(10):1964-7. [Medline]. Rajendran JG, Lewis DH, Newell DW, Winn HR. Brain SPECT used to evaluate vasospasm after subarachnoid hemorrhage: correlation with angiography and transcranial Doppler. Clin Nucl Med. 2001 Feb. 26(2):125-30. [Medline]. Bederson J B, Connolly E Jr, Batjer H H, MD, et al. Guidelines for the Management of Aneurysmal Subarachnoid Hemorrhage: A Statement for Healthcare Professionals From a Special Writing Group of the Stroke Council, American Heart Association. Stroke. 2009;40:994-1025. Available at http://stroke.ahajournals.org/content/40/3/994.full. Accessed: May 21, 2009. Mayberg MR, Batjer HH, Dacey R. Guidelines for the management of aneurysmal subarachnoid hemorrhage. A statement for healthcare professionals from a special writing group of the Stroke Council, American Heart Association. Stroke. 1994 Nov. 25(11):2315-28. [Medline]. Wiebers D. The International Study of Unruptured Intracranial Aneurysms Investigators: unruptured intracranial aneurysms&#151;risk of rupture and risks of surgical intervention. N Engl J Med. 1998. 339:1725-32.